The deadline to be considered for full-tuition fellowships for the fall term is January 7. We will continue to accept fall applications on a rolling basis. The deadline for fall term regular applicants is August 1. The deadline for fall term international applicants is June 15. The deadline for spring term applicants is October 15. Spring entry is an option for the MA and Certificate programs. I can't afford the $50 application fee. Can it be waived or deferred? The New School waives application fees for those who meet the eligibility guidelines outlined on the Apply Online website. Graduate Record Examination (GRE) scores are required of all applicants who are U.S. citizens or permanent residents who completed their bachelor's degree within the five years preceding the date of submission of their application. International applicants or applicants who are U.S. citizens or permanent residents who completed their bachelor's degree more than five years previous to the date of application submission may apply without submitting GRE scores. GRE results should be sent by the Educational Testing Service (ETS) directly to the Office of Graduate Admission. The institution code is 2501. Do I have to take the TOEFL, IELTS, or PTE? A TOEFL, IELTS, or PTE score is not required for applicants whose primary language is English, or for applicants who have earned a four-year degree from a U.S. college/university or from a university where English is the primary language of instruction. For more information, please refer to the application instructions. When will I hear about my admissions decision? The decision for applications that are complete by the January 7 deadline will be communicated by email in mid-March. Decisions for applications received thereafter will be communicated by email on a rolling basis. I've been accepted. How long do I have to accept the offer of admission? Please check your admission letter to see what your deadline is to reply to our offer, along with instructions for confirming your enrollment. If you require additional time, please contact our office and we will try to accommodate you. Graduate students are not eligible to defer, but may be considered for readmission. Readmission information can be found on the Accepted Students website. How do I apply for fellowships and scholarships? Students who complete the application process by January 7 will be considered for full fellowship awards and additional merit scholarships. Applications received or completed after January 7 are considered for partial scholarship awards and other forms of financial aid on a rolling basis. More information about Financial Aid and Scholarships can be found on our webpage. Applicants will need to complete the Free Application for Federal Student Aid (FAFSA) if you wish to apply for federal or private loans. For more information, see Financial Aid and Scholarships in the Academic Affairs section of this website. How long do the MA programs take to complete? The MA is designed as a two-year program. Most students complete the MA within two years. I only want to take a few courses at The New School for Social Research. How do I apply for non-degree status? For non-degree/non-matriculation status, you need to submit the Non-Degree Application for Admission, a two-page statement of purpose and one letter of recommendation, the $50 application fee, and undergraduate transcripts showing proof of a bachelor's degree. You may take up to three courses as a non-degree student over a one-year period. Please contact the Office of Admission. Are counselors available for advising? Counselors are available on an appointment basis. Contact the Office of Admission to arrange an appointment by calling 212.229.5150. Yes. Please see the Housing section of this website. Does NSSR provide scholarships for master's students? Yes. 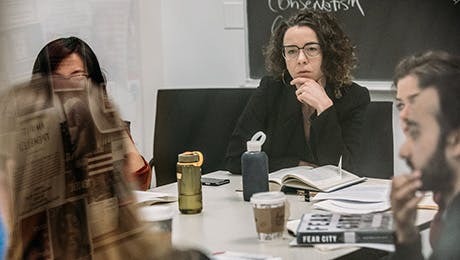 In fact, more than 80 percent of the incoming master's program cohort in fall 2018 at The New School for Social Research received merit scholarships. The average scholarship was 40 percent. Master's program applicants must apply by the January 7 deadline to be considered for full fellowships. Partial scholarship awards and other forms of financial aid are considered on a rolling basis. What information does NSSR have about alumni outcomes? Each department carefully tracks the outcomes of its alumni. Applicants are encouraged to familiarize themselves with the Recent Placement sections of the department to which they are applying.